My wonderful wife bought me a Nook for Christmas, so I immediately took advantage of it by downloading a number of public domain books, including this Peter Wimsey mystery by Dorothy Sayers. Frankly, the novel was less memorable than the experience of using the e-reader. I’m so glad to have a way to read e-books other than the computer! He provides some of the best arguments against secession I have ever read. Chief among them: states might have had the right to secede after the Constitution was signed, but their subsequent participation in amending the Constitution and the federal investments in the states oblige states not to secede with mutual agreement and compensation. He viewed the Confederate claims to federal armories and to the state of Texas (purchased by the federal government) as theft. Through the use of the telegraph, Grant might have been one of the first people to form long-distance friendships in real-time. He and Lincoln, along with other high-ranking officials, would have late-night conversations via wire. With Lincoln, he formed a close personal and professional bond before they had ever met face-to-face. Grant thought nothing of bringing his 13-year-old son to the battlefield. Talk about “free-range kids”! The third volume in my new favorite contemporary fantasy series. Oh, it was good! I became sad when I realized that I had read more than half of the book. 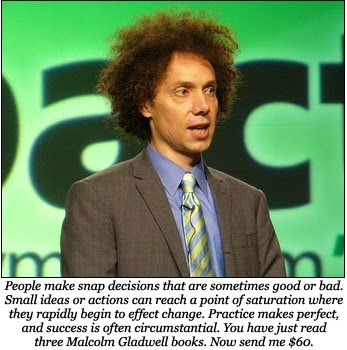 People have started making fun of Gladwell for making somewhat obvious points, but man, is he a good storyteller. John Wilson and Stan Guthrie of Books & Culture turned me onto Andrew Klavan’s thrillers, but I wasn’t too impressed with this one. The main character’s conversion to Christianity, which happened before the book began, but after his youthful misdeeds set the action in motion, never seemed more than a plot device. An “inside baseball” account of the first 60 years of InterVarsity Press. As a fair warning, if you don’t have a history with InterVarsity or in Christian publishing, or a strong interest in either, this book may be of little interest to you. If you do, however, you’ll be fascinated with the behind-the-scenes stories of Christian authors like John Stott, Francis Schaeffer, Paul Little, Calvin Miller, and Jim Sire. I had never seen either film version before reading the novel (I’ve since seen the Coen Brothers’ version), and it’s too bad that the classic films have overshadowed the original novel. Portis pulls off a doubly unreliable narrator â€” an extremely religious, miserly old woman remembering events from when she was a naive fourteen-year-old â€” and delivers a novel that is at once comic and thrilling. Fantastic. Somehow, I managed to read three different fantasy series over the summer. A science fiction classic, this novel tells the story of the invention of the ansible, a key technology in Le Guin’s novels that allows instant communication across interstellar distances. That’s only a subplot, however: the main story involves a brilliant scientist faced with the decision whether to leave behind his family and culture and enter another society where he knows he and his invention will be exploited, but which could lead to greater understanding and fundamental changes for both worlds. This month must have had other excitements, since I can’t seem to recall a single book I read! I really enjoyed this book and learned a great deal. I’ve submitted a review of it to Books & Culture, which I hope will be published soon. I picked this up from the Boone County Public Library used book sale. One of Le Guin’s earlier sci-fi novels. The main character discovers that his dreams can change reality, and the psychiatrist he turns to for help decides to use this power to “improve” the world. Cue ominous music. While Godin is best known for his role as an “internet marketing guru,” I read this book to help with my fundraising, based on a recommendation from InterVarsity Area Director Steve Tamayo’s blog post about fundraising and permission marketing. An excellent book. Nothing in it is rocket science, and many of the examples and case studies are now quite dated (the book was written in the mid-90′s), but the basic principles are powerful. Another library book sale find. I read one of the middle books in the series a few years ago, and found it utterly incomprehensible. Starting at the beginning — and keeping Wikipedia open on my iPhone! — improved my reading comprehension considerably. I can see why the novels are so highly praised, though I’m not sure if they’ll ever become a favorite of mine. While I had seen this novel at the library, my desire to read it grew after I saw that it tied Twilight as the 5th favorite novel of Scripps National Spelling Bee finalists. I quickly learned that, well, of course it is: the opening scene features a newspaper ad that reads, “Are you a gifted child looking for special opportunities?”. It’s been added to my list of contemporary J/YA fiction to follow. * Within a century of Columbus’ landing, Spaniards in the Philippines were trading Bolivian silver for Chinese silk, creating the first truly global economy. * American potatoes and sweet potatoes essentially ended famine in Europe and Asia. * American rubber trees form a major part of Southeast Asia’s economy. * “Traditional” ethnic foods from Italian red sauce to Szechaun pepper dishes could not have existed before the Columbian Exchange, because they rely on New World foods. A pretty cool premise: the adult daughter of superheroes just wants to get on with her life, go more than a couple of weeks without being kidnapped by would-be supervillains, and progress in her accounting career. When her firm is hired to provide forensics for the prosecution of her parents’ greatest nemesis, her carefully laid plans fall apart.